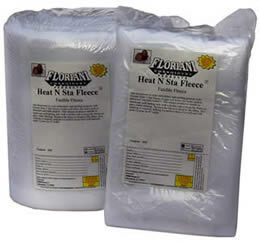 Add dimension to your embroidery and quilting projects with Floriani Heat N Sta Fleece. Create soft home dec items such as placemats, table runners and crib quilts. This unique product is similar to traditional quilt batting only with a fusible side to keep the fleece in place while stitching through it! Heat N Sta Fleece is ideal for machine embroidered or T-Shirt quilts as it does not have to be quilted to maintain the fibers of the batting. It is machine washable, dryer and/or drycleaner safe. Complete the embroidery design, remove stabilizer from around the design. Fuse one layer of Floriani Heat N Sta Fleece over the back of the embroidery. From the front side of the garment, quilt around the design using a straight stitch. Trim the excess fleece to within ½ inch of the stitching. Now you have 3-D embroidery and a super soft design against your skin! Complete piecing of the blocks. After the top is completely pieced, fuse one layer of Floriani Heat N Sta Fleece on the backside of the fabric. Be sure to use a medium setting (silk) on your iron and a press cloth to protect your iron. Also remember to "press". Ironing will stretch the fabric and the fusible fleece. Add the fabric to be used as a backing, and quilt as usual.